Life saving devices and swimming aids are certainly not a modern creation. In 1539, a German professor, credited with writing the first swimming book, referenced some rather creative, early flotation aids that included cork belts, reed bundles and air filled cow bladders! Fortunately for the modern day swimmer, flotation aids have come a long way since then and in this article we’ll take a look at the types of swimming aids now available. Flotation aids and devices enable the learner swimmer to build confidence and skill upon the water. The buoyancy they provide helps the user maintain the right position when practicing swimming strokes and allows the user to concentrate on mastering swimming techniques without being pre-occupied with trying to stay afloat. The ‘right’ swimming aids will often depend on the child. Each swimming aid tends to have its own benefits and drawbacks. Arm bands tend to offer good buoyancy but can be restrictive where certain swim strokes are concerned. If you intend to use arm bands, or other inflatable flotation aids, a good trick is to gradually deflate the device as the user becomes more confident. This ‘weaning off’ process can build confidence and ensure that the user doesn’t develop too strong a dependency on the inflatable swim aid. Kickboards can be very useful when teaching older children or adults who may not wish to wear flotation aids. However with kickboards the user can feel a little less stable upon the water than they would whilst using an attached flotation aid. 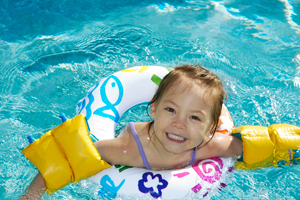 For young children, swim vest or float suits can often provide the ideal solution. With these, the buoyancy is distributed around the user’s chest and mid-body (much in the same way as the traditional life jacket). This can provide the child with decent buoyancy and a good sense of stability whilst leaving the arms free (without the restrictions of arm bands) to practice swimming techniques. As well as for young children, swim vests are available in youth and adult sizes, again offering good buoyancy distribution. They are available in many colours, often having an attractive appearance which can ease the embarrassment felt by many non-swimmers at having to use swimming aids. The other benefit of swim vests is that they often come fitted with individual removable floats which can be gradually removed as the user becomes more confident within the water. As with the method of gradually deflating inflatable aids, this is a great way to gently get used to having less and less support from your swimming aid. Even when wearing swimming aids, children should never be left alone in water as flotation aids and other buoyancy devices are not life saving devices. Please ensure your child is constantly monitored by a responsible adult who is competent in water and if you need to leave the pool, even for a few moments, please take your children with you, as it only take seconds for an accident to occur. To find a local pool supplier who stocks swimming aids please use the link at the top right of this page. What swimming aids helped you develop confidence in the water? Have we missed something that helped you? Get in touch with your comments using the box below.